Recently, my wife and I helped a family of five look for a place to stay in Tokyo. We checked AirBnB, Trivago, Agoda, Expedia and Booking.com. Too many options in such a big, cosmopolitan city so we narrowed down the possibilities by agreeing that Shinjuku and it’s environs is the place to be and the hotel/apartment hotel/BnB must be relatively near a train station. After three hours of browsing the internet and discussing the many possibilities, I came up with my 5 places to stay in the Shinjuku area. 1. Sunroute Plaza – our family’s choice hands down. Near the Shinjuku JR station, Takashimaya and Shinjuku Park. Just walk around the area and you will see all sorts of shops and restaurants. Hotel price is reasonable for Tokyo averaging $150 a night. As an added convenience, the Airport Limousine Bus picks up and drops tourists by the hotel doorstep every 3 hours for Haneda and 2 hours for Narita. 2. Citadines – The selling point of this apartment hotel is the kitchenette. If you like to cook, this place is for you. Marusho supermarket and convenience stores are nearby. Train station is about 400 meters away. A bit far if one travels with small kids. During the wintertime. I can imagine the hassle. 3. Hotel Wing Premium Yotsuya – website says this is the first Premium hotel of the Wing Group. 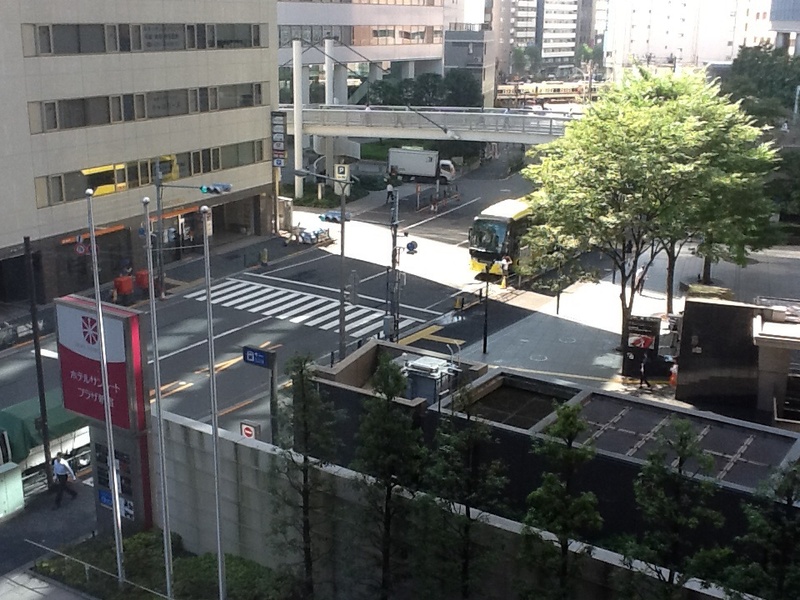 This new hotel looks nice in the pictures and it’s location is very near the Yotsuya Sanchome train station. 4. Tokyu Stay Yotsuya – I believe one must stay at least a week in this apartment hotel. Room is cheapest compared to the four others mentioned in this blog. And they even serve breakfast! All reviews from the travel website are favorable. This one I want to try coz of the price but it is farthest from my relatives. Tho it’s next door to Sophia University, my son’s school. 5. Shinjuku City N.U.T.S. Tokyo. The hotel with the funny-sounding name is the wildcard. This used to be a love motel converted into a hotel so it has big bathrooms. Each room looks different tho so choose well. I take this place into consideration coz it’s two blocks from my mother-in-law’s apartment. These places are normally under $200 a night. Other hotels or apartments can be cheaper but check the location. It may be cheap but if it’s far from a train station, a cab will be needed and that costs. Cleanliness is a virtue in Japan so it’s safe to assume that any place to stay is clean. When booking a room, pls check the room size. Space is a premium especially in Tokyo and rooms can be pretty claustrophobic for some. My wife and I also recommend Shibuya and Harajuku areas as other places to stay. These areas are bustling and full of fun things to do. Just check the location and amenities. Book a vacation soon! Our first stop was his first choice for ramen but unfortunately it was full. So we went to his second favorite ramen place and had some garlic ramen which tasted like adobo to me. The garlic ramen and gyoza were good and we all came out satisfied. At that point my wife bade goodbye and went home by herself by train. Not to worry – Japan is super-safe and women have nothing to worry about. So now enough of the sissy stuff. Bring out the hard stuff! Since it was still Happy Hour, Ken and I went to an expat bar which served a tall glass of Craft Beer for under Y1000. We tried two kinds of craft beer and then proceeded to our next stop. Everything is walking distance so not much time is wasted. Our second watering hole had an offer for Y2000 ($20 or P880) with all-you-can-drink for 2 hours. Since I was full with the ramen and 2 craft beers, I thought I should drink hot sake (rice wine). Sake has a higher alcohol content than beer but it’s ok. This is once in a blue moon anyway. And I forgot to mention that part of the deal was we had to order three appetizers. Overall it was a good deal and I was already buzzed but we weren’t done yet! For our last watering hole, we went to a karaoke bar. I don’t know how much it cost but the deal was we get one big glass of soda for free. Before we went in, my son ran to the convenience store across the street and bought cheap whiskey and put it inside his knapsack. At this point, I was really woozy. We stayed in that karaoke bar for about one and a half hours (so I was told) and I remember singing only 2 songs! Ken was singing Tagalog songs to my amazement. This joint had no playbook. You have to know the song title or artist. And it was pretty high tech! So I had my soda and my buzz and all I remembered was that the taste of my soda kept on getting worse and worse. What I didn’t know was that when I wasn’t looking, my son would pour some whiskey! Funny at my expense, of course! No wonder I was wobbly walking to the train station and hotel. After that it was all a haze. Suffice it to say I made it ok all the way to the room. My son gave me a Japanese anti-hangover drink but since I was really buzzed, I forgot to drink it and water as well. I think I had a hangover for the next two days but it wasn’t something I couldn’t handle. I remember my wife saying, “Ken, what did you do to your papa? He can’t remember anything!” Of course my son said “What did I do?” with that feigned innocent look. But everything was cool. I like these bang-for-the-buck promos even if it had cost me more than just money if you know what I mean. Looking forward to another night of adventure next time I visit Tokyo. Oyasuminasai! I read recently in Spot.ph that Ippudo is coming to the Philippines on September 10 and opening its first branch in MegaMall Fashion Hall. That’s great news! 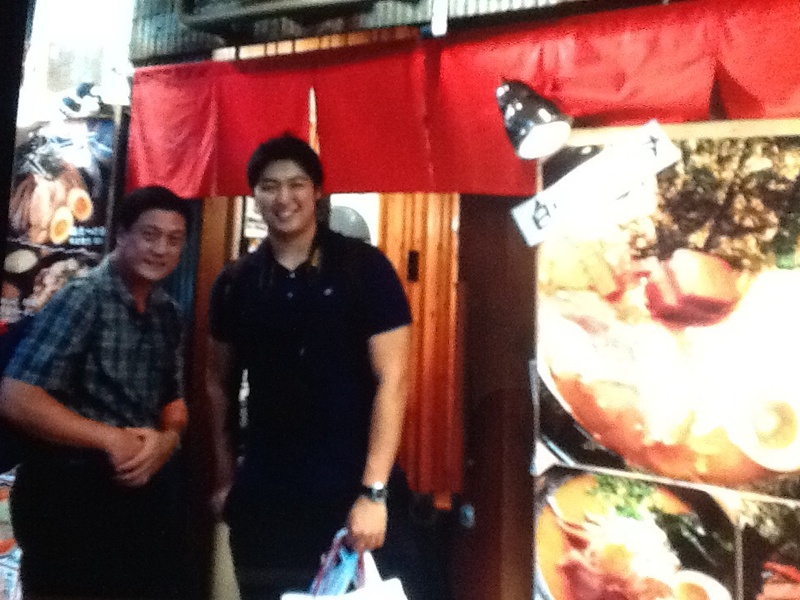 I loved the Ramen and Gyoza which I tried in their Tokyo branch and I would like to narrate how I got there. 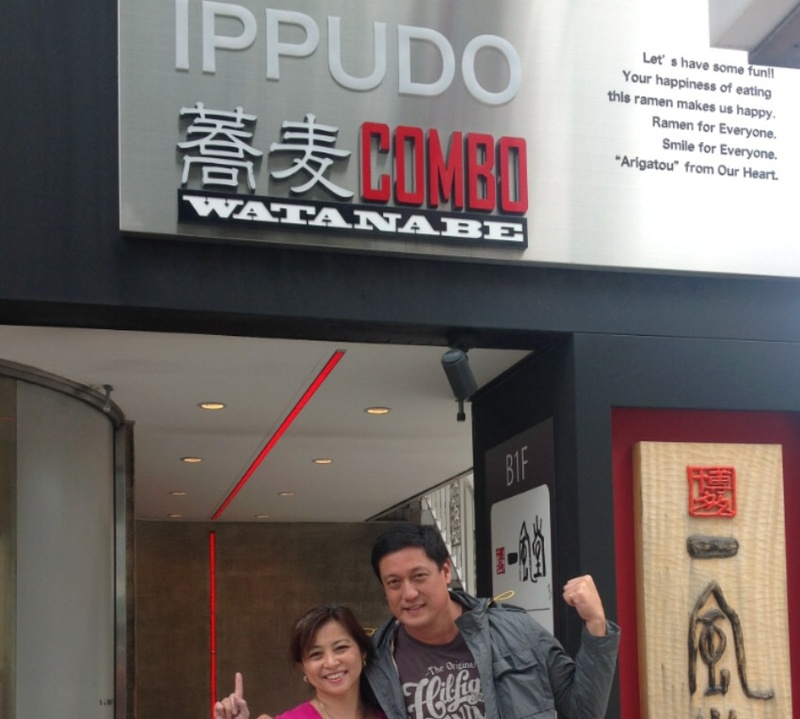 On one Saturday afternoon, my wife, Ken and I decided to have a late lunch somewhere in Harajuku. So we took the Yamanote train from Shinjuku, went down in Harajuku, and walked down for about a kilometer to a still-developing, American-looking part of Tokyo. Ken’s first choice of restaurant was a Gyoza place but there was a long line outside which surprised me because it was already 2:30pm. Maybe it was a weekend so people eat a late breakfast and also a late lunch. Then we went to an American BBQ place which was packed with expats having a party. At that point I was willing to eat anywhere. Normally I eat between 12-1pm and I could feel myself getting hungry…and cranky! So my son tells me, “There is an Ippudo nearby. Just walk up the hill a bit.” At that point I was sold! So we walk up the hill. Yeah, nearby meaning another kilometer uphill! We walk up the Omotesando shopping mall – thank God we didn’t even stop to look because stores were super high-end! Every corner we passed I would look left and right and ask, “Where’s Ippudo?” When we finally hit the main road, we turned left and walked another 200 meters. Finally we made it . . . but it looked closed! No one seemed to be inside. Anyway, I was so hungry since it was already 3pm, I go in and there were waiters and cooks waiting. Ok, let’s see what the hype is all about. Since I love Tantanmen, my son ordered for me and him a relatively spicy Ramen. My wife had the usual Tonkotsu Ramen. We also ordered the Gyoza and it was excellent! We ordered one more. It was my first time to see garlic, sesame seed and pickles to add taste to the Ramen. In my hunger, I ate the pickles already while they were still ordering and I even ate the raw garlic (since I love garlic) and this made my family laugh. “Why? What did I do?” I asked. “You are supposed to crush the garlic on top of the Ramen, not eat it raw!” Oh well, you learn something everyday. So I’m eagerly awaiting the opening of Ippudo in MegaMall. Well, not really eagerly because I don’t want to wait in line. Let’s see how it goes. When Ippudo comes in, the food has to be impressive because Ramen Nagi has just set the bar for Ramen chains. Having tried both, I can give my two cents worth but I will reserve further comments until I try the local Ippudo. First-time tourists normally stay between 3-7 days in Tokyo. There are many places to visit – Ginza, Shinjuku, Imperial Palace, Tsukiji Market to name a few. Shibuya is another place worth seeing. Among the younger set, Shibuya is a popular tourist spot and the Hachiko statue is a favorite meeting place. It’s just right outside the train station and chances of not finding it is slim. When the group is complete, they walk across the wide intersecting street with a sea of humanity and then head to the numerous side streets which house numerous restaurants, bars, karaokes and shops. Why is the Hachiko statue so well known? 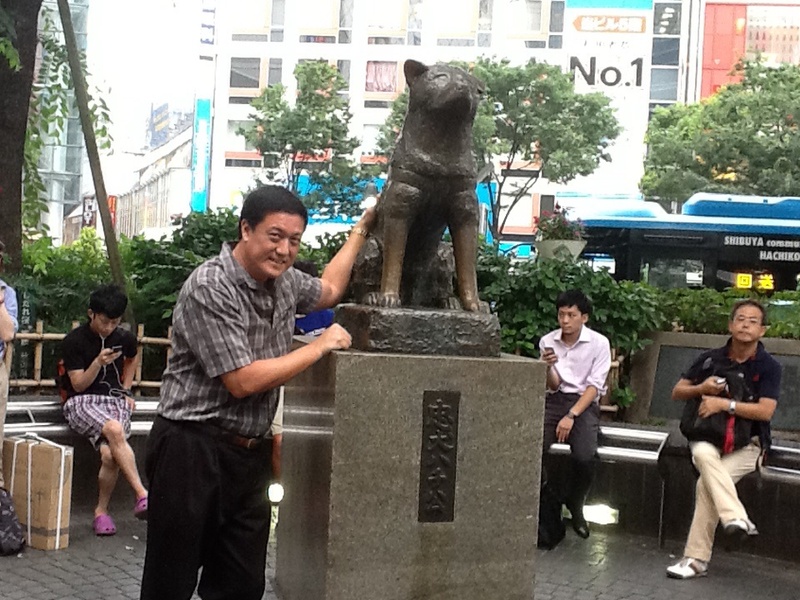 Foreigners are well-versed with the Hachiko story of the loyal dog waiting for his Master. One proof of the dog being Man’s Best Friend. I saw once a Richard Gere movie about Hachiko. It was touching and wouldn’t mind watching it again. Apparently, a lot of foreigners were so touched with this film whenever they have a chance to visit Tokyo, the Hachiko statue is a must see and photo opportunity. Travel advice if one were to travel to Tokyo – go thru Haneda. Much more convenient than Narita. Haneda is a nice airport. Gien a choice, try to get lounge access. The ANA lounge is spacious and has good food and drinks. 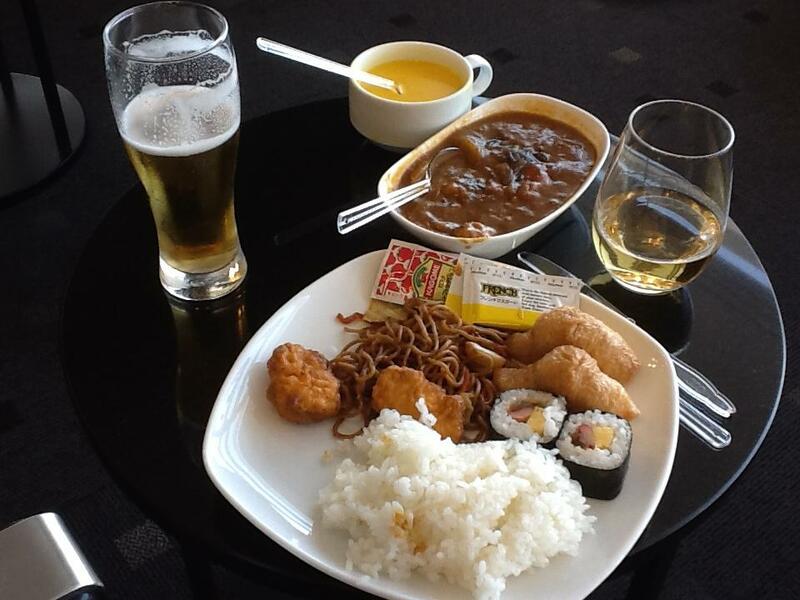 And before I forget and the topic becomes impertinent, here is a sample of the food and drinks in the PAL Mabuhay Lounge managed by ANA in Haneda. For food there was Japanese cream of corn soup, curry rice, Imari sushi, chix nuggets, yakisoba and there was even a soba station! For drinks, I had the Yamazaki single malt (must have!) and Asahi Super Dry beer. Of course they had other juices and soda. Til next year!